I tried to watch this and couldn't get through half of the episode. It was like they wanted to hit every single progressive talking point in a single episode. I guess this is in the same vein as Riverdale. Take a G-Rated comic book and make it an R-Rated Drama with adult themes. I'm note sure who they are making this series for? They cast unattractive actresses to play the Aunts, one being a Fatty and the other looks 70. Sabrina looks like a Fifteen year old girls face on a ten year old boys body, and cute but not a great beauty. I'm guessing they think this will attract female viewers. Guys are the market for these kinds of shows. Zena, Buffy The Vampire Slayer, and they had hot chicks. 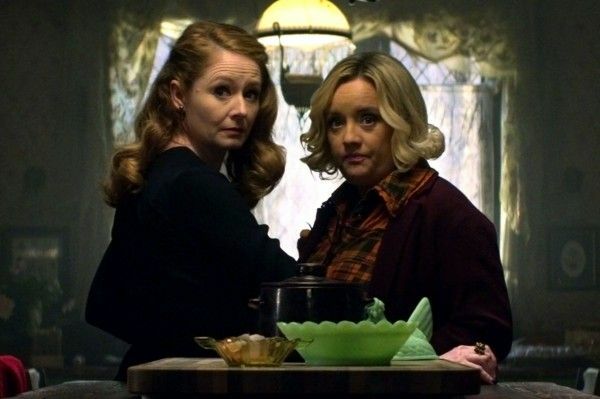 Aunt Hilda and Zelda Not exactly Milfs. The Original Aunts and Sabrina. You thought Caroline Rhea wasn't a "fatty"? Really does sound terrible. At least, according to CBR. I shall not be watching. But it's Eowyn from LOTR and Dawn from The Office...in their 40s...oof, Otto is 50.